A denture is a removable device that is used to replace missing teeth. Dentures are crafted with an acrylic resin and other materials. The dentists at Gentle Dentistry offer this service to our patients in the Kalamazoo, MI area. There are two basic types of dentures: full and partial dentures. Complete dentures are made when all the teeth on the top and bottom of the mouth are missing. Partial dentures are used to replace some missing teeth and hold the remaining teeth in place. The best candidates for this procedure are patients who have lost all or most of their teeth. 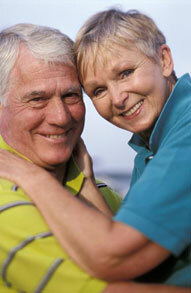 Dentures offer more than aesthetic benefits. The denture improves the ability to eat and speak. In addition, replacing the missing teeth with a denture offers support for facial muscles and prevents the sunken appearance that can occur when teeth are lost. Advances in dental technology has improved dentures and allowed for the development of immediate dentures. This type of denture can be used immediately after the remaining teeth are removed without waiting for the tissue to heal, as with conventional dentures. This will require he dentist to take measurements and make a model of the jaw in advance. The biggest advantage is that you won’t need to go without teeth during the healing period, but the gums and bones shrink over time and relining or rebasing may be needed. A partial denture is a device used to replace some missing teeth. The removable denture is attached to the natural teeth with metal clasps or precision attachments, which are virtually invisible but more expensive than metal clasps. Crowns on the natural teeth help to improve the fit. It takes about five appointments over the course of a month to make dentures. These appointments are for an initial diagnosis, making the impression and wax bite, a try in appointment, and placement of the final denture. The process begins with making an impression and taking measurements of the jaws and the space between them. The color of the natural teeth is considered and the information is given to the dental laboratory, where the denture will be made. The dental lab makes a mold of the jaw and sets the replacement teeth in a wax base. The wax is carved in the form of the finished denture and used for a “try in” with the dentist. If adjustments are needed, they are made before the final denture is completed. To complete the denture, a mold of the wax denture is made, the wax removed and the space filled with pink plastic. The plastic is hardened with heat and polished. It will take some time to get accustomed to your new dentures, usually a few weeks. While it will take some practice to insert and remove the denture, it should fit easily. Don’t bite down to force the partial denture into position, as the clasps can break. Even if it is not comfortable at first, it was important to wear the device in order to determine areas that may need adjustment. If an area becomes sore, the denture ca e adjusted for a better fit. When you are getting used to the dentures, you will need to eat soft foods and hard and sticky foods should be avoided. Clean your denture over a towel or sink filled with water to avoid dropping and damaging it. A denture brush should be used to brush the device every day to remove food and prevent staining. Use denture cleansers that have the American Dental Association Seal of Acceptance, hand soap, or a mild dishwashing liquid. Dentures need to stay moist to retain their shape, which is why they are placed in water or a soaking solution at night. If you have a partial denture, pay attention to brushing the teeth where the clasps attach to avoid tooth decay. Oral hygiene is also important when you have no natural teeth. The gums, tongue and palate should be brushed before inserting your dentures to remove plaque. Several factors can result in the need for adjustments to dentures. The mouth changes with age, bones and gum ridges may shrink, and the dentures can come loose, which can result in infection or sores. Ill-fitting dentures can be adjusted easily, so avoid using do it yourself kits and over the counter glues to avoid damaging the device. Often, repairs can be made right in the office on the same day, but complex problems may require sending the device to the dental laboratory. With normal wear, the device may need to be rebased or relined. Eventually, the denture may need to be replaced, if it is too loose or the teeth are worn. Eating – Eat soft foods in small pieces at first and gradually resume normal foods. Chew on both sides of the mouth to prevent tipping and exert even biting pressure. Be careful with sharp, hard, and sticky foods. Speech – While people often worry about the denture affecting speech, it is much more affected by missing teeth. At first, it will take time to pronounce certain words, but this improves with practice and many people find that reading aloud is helpful. Speak slowly to avoid clicking and reposition dentures, if they slip. Denture adhesives improve retention, but only for well-fitting dentures. If the denture does not fit properly, sores and other problems can result. The denture may need to be adjusted, relined, or replaced, so always consult the dentist. If you are interested in dentures to replace missing teeth, please contact us at (269) 381-3890 to schedule an appointment with a dentist in Kalamazoo, MI.